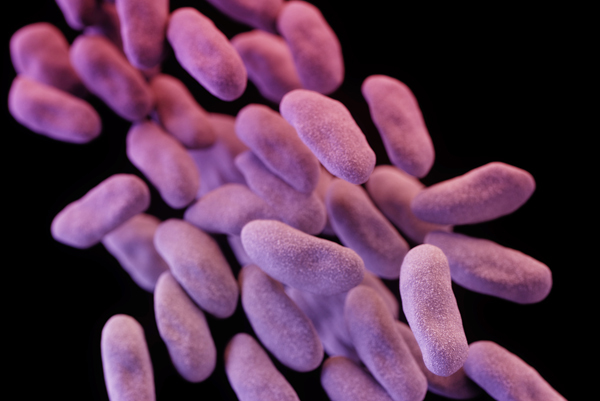 Infectious disease experts are “deeply alarmed” by the death of a US woman due to a bacterial infection resistant to all available antibiotics. high level antimicrobial resistance (AMR) is widespread, meaning that common pathogens will be untreatable. Should this be the case, it would profoundly affect all areas of health care, and society. Simple childhood infections would once again be life-threatening events, major surgery would be associated with high mortality, chemotherapy for cancer and organ transplantation would no longer be possible. the introduction of AMR by ingesting imported food products and through international travel. Prof Jones and her colleagues back the call from the Australian Medical Association for the immediate establishment of an Australian National Centre for Disease Control, “with a national focus on current and emerging communicable disease threats, engaging in global health surveillance, health security, epidemiology and research”. Read more about the editorial on Scimex.org. Medical illustration of Carbapenem-resistant Enterobacteriaceae. Credit: CDC. The case which so concerns the authors of the MJA editorial was first reported by the US Centers for Disease Control in January 2017. The 70 year old woman had recently returned from extensive travel in India, where she had been treated for a broken hip and femur. Once back in the US, she was hospitalised with a related infection found to be caused by a strain of the bacteria Klebsiella pneumoniae, belonging to a class called carbapenem-resistant Enterobacteriaceae (CRE), that was resistant to all available antimicrobial drugs. The woman died from untreatable septic shock several weeks after entering acute care. CRE are nightmare bacteria. They pose a triple threat. First, they’re resistant to all or nearly all antibiotics. Even some of our last-resort drugs. Second, they have high mortality rates. They kill up to half of people who get serious infections with them. And third, they can spread their resistance to other bacteria. So one form of bacteria, for example, carbapenem-resistant klebsiella, can spread the genes that destroy our last antibiotics to other bacteria, such as E. coli, and make E. coli resistant to those antibiotics also. The looming threat of a post-antibiotic era is garnering attention here in New Zealand. 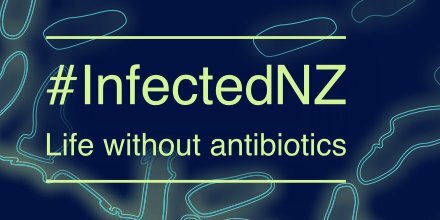 Late last year Te Pūnaha Matatini ran the #InfectedNZ campaign – an online discussion underpinned by an extensive series of blog posts from leading New Zealand researchers. Issues explored in the series included: the hunt for new antibiotics, the role of animals in AMR, the economic costs of AMR, patient experiences and much more. Sciblogger Dr Siouxsie Wiles, who spearheaded the campaign, has also just this month published a new book, Antibiotic Resistance: The End of Modern Medicine? (Bridget Williams Books; check out a Sciblogs review here). The book succinctly outlines the history of antibiotic medicine and its increasingly uncertain future. The review is directed towards raising public understanding of antimicrobial resistance and its implications for health to enable individuals to make more informed choices. The aim is also to provide a picture of the consensus of scientific opinion on factors leading to an increase in anti-microbial resistance, globally and in New Zealand, and to describe risks and opportunities for the future. 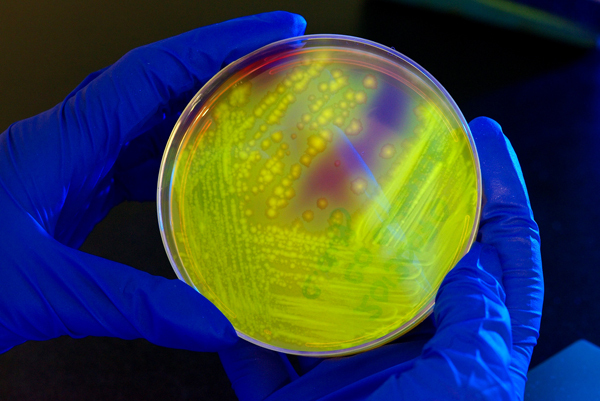 Featured image: CDC staff show two plates growing bacteria in the presence of discs containing various antibiotics. The isolate on the left plate is susceptible to the antibiotics on the discs and is therefore unabble to grow around the discs. The one on the right has a CRE that is resistant to all of the antibiotics tested and is able to grow near the discs. Credit: CDC.